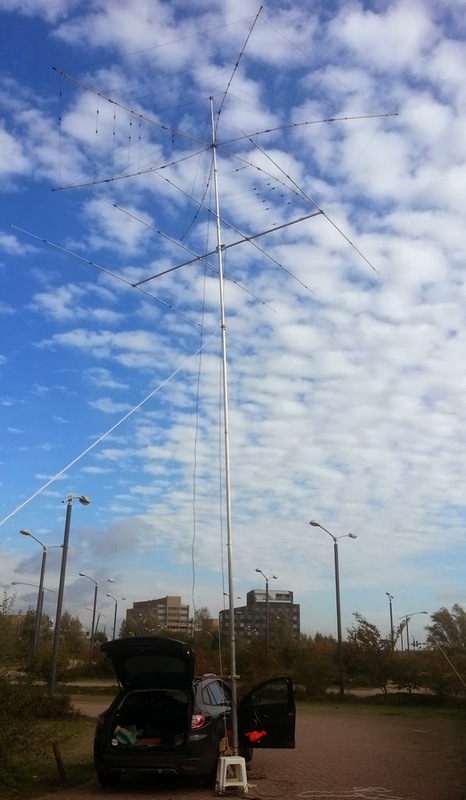 Saturday I went out for an afternoon and evening of DX fishing in the CQWW contest. Setting up my rather elaborate /P station - see previous posts - took more time than during the last test on Wednesday. The wind was to blame. Aiming for DX I was a bit too enthusiastic and started with a fully extended mast. With both antenna's on it (yagi and hexbeam). The last section however is not strong enough in windy conditions. With the whole construction up I saw it rocked far too much and no guying was going to help. So I took the mast down again, removed the yagi and lowered the upper section. All in all it took me more than an hour to get the station in the air. The mast was a little lower than I hoped (hex at approx 11m and yagi at 9m) but it stayed upright and was still turn-able while guyed. At 13h local time the hunt started. With my cluster app and two fellow hams - PD7YY and PA3GGI - online via WhatsApp I was able to find quite a number of new band DXCCs and even completely new DXCCs. I hopped around over the bands using the yagi for 10m and the hex for all others. The yagi pointed in the opposite direction from the hex, so I was able to quickly determine SP/LP paths on 10m by switching between the two antennas. From the ones I actually heard I in the end missed three: VP2M (pileup too large and then gone) and FO4 (faded while calling by number) for new one all band and 7O on 20m for new band (lost in splatter). See the list and map at the end of this post for the total score. Around 22:30h 10m was closing and I did not notice any new ones any more on the other bands so I took down the mast and antennas. At 23:30h however I was still not ready (mentally..) to go home so I set up my inverted V for 40m. This is a challenging band for DX in almost all cases but definitely when you are /P. Before this day my top DX on this band was KP2 (7000km) from home with a shortened dipole abt. 4m above my roof, followed by one US station from NJ (6000km) using my sloping wire and then R9 stations less than 5000km away. 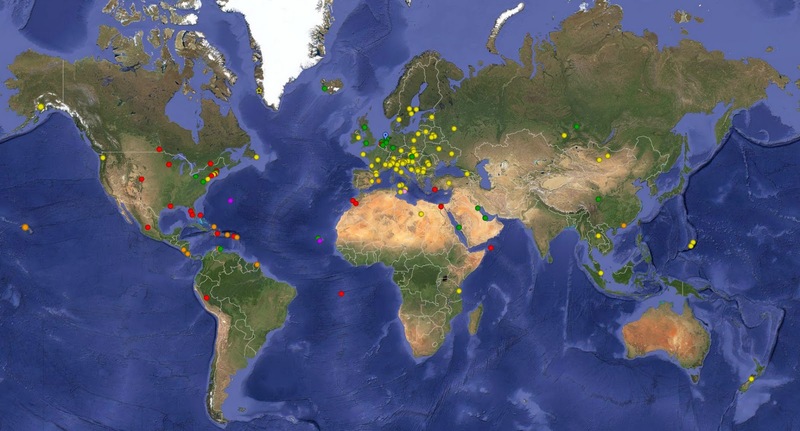 I did work some more US stations but only digitally and all at < 6500km. So I was very happy when I added to W3LPL (6300km) as the first station on 40m this evening and even more happy - not to say ecstatic - when I added B9 (6500km and new DXCC on this band). Then I tried to hunt TF (new one as well on this band) but the pileup was too large as every serious contester was looking for zone 40. When I came back later he was gone but to my total surprise the station that was on his QRG and actually copied me was PJ2T. Brilliant! New max distance on this band with almost 8000km. I added a few more US stations and RW0A to complete the DX hunt on this band. I did manage to log TF later and added new DXCCs on this band from A7, 9K and HZ. At 1:00am I ended the operation for the day planning to return in the morning to look for some remaining new ones on the higher bands. Sunday morning the weather had deteriorated however. As I was quite happy with the results of Saturday and not looking forward to getting extremely wet while setting up a large antenna in windy and rainy conditions I decided to stay home and work some more stations with my sloping wire (end fed). With this minimal set-up I just scanned the 10, 20 and 40m bands and called whoever I heard - handing out some points. I added two new band contacts with 7Z on 20m and XP on 20m (PSK). Most of the contacts were in EU but I did manage to work US into W7 and even KL7 on 10m and 20m. The map above shows the contacts in this contest. Green dots are 40m contacts, yellow ones 20m, orange 15m and red 10m. There are also three pink ones of WARC contacts. Together with the PSK contact (yellow star) with XP they are the new band contacts I made outside of the contest. 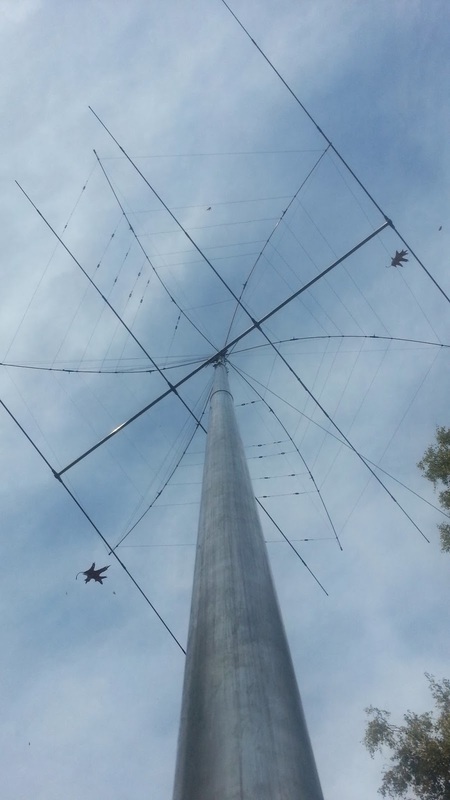 The total score this year is 6 new ones (all band - 5H, 7O, C6, OA, TI & XW) and on top of that 24 new band ones: 7 new on 40m, 9 new on 20m, 2 new on 17m, 7 new on 15m, 1 new on 12m and 8 new on 10m. Yesterday morning I had some time to go out again to do some /P-DX-hunting and some lasts preparations for CQWW. With 10m open as it is at the moment (yeah!) I decided to bring both my DX antennas: my 4 element yagi for 10m and my 6 band hexbeam. My idea was to try both to decide what I would bring next weekend to my CQWW chase. I tried to set up both antennas on my aluminium mast to do some A-B testing. It turns out my home-brew mast is sturdy enough to carry both antennas. 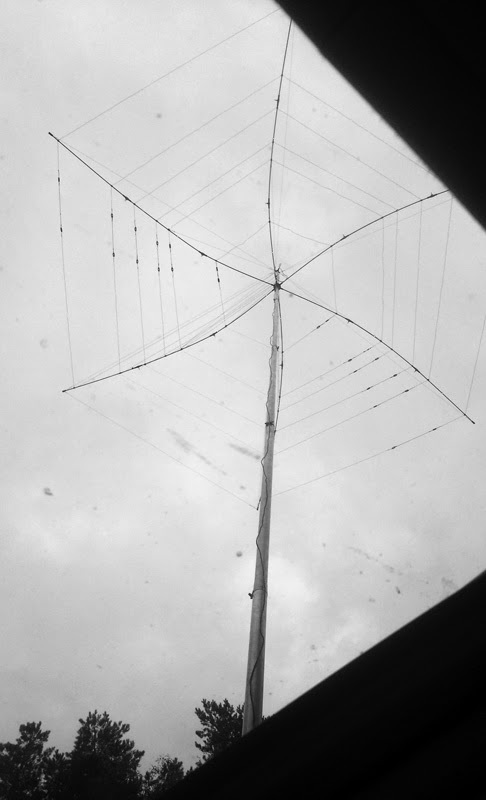 The hexbeam was on top (due to its construction it must be - it inserts into the upper tube of the mast) and the yagi some 2-3 meters below it. I used one guy wire just to be sure the mast would not bend too much, but in fact it was not really a necessary addition - even though it was a bit windy. This gave me a set-up that looks very impressive (to me as the ham-without-a-beam-at-home at least) and turned out to be effective as well. Being limited in time and of course using this opportunity also to catch some DX, I did not do a lot of A-B TX tests - it is quite bold to ask that DXpedition to give two real reports. One JA OM told me there were some 2-3 S-points difference (in favour of the yagi). Closer by a UY OM saw less difference. So there is still some testing to do. On RX however I could test the difference all the time. Here I saw that the yagi even when positioned lower is one S-point stronger. This is especially noticeable on the weaker signals. There you could really hear (as well as see) the difference. During the short period I was actually on the radio I managed to log DX from TN2 (new band), HS0, B9, JA3, R0 and D4 (new band). 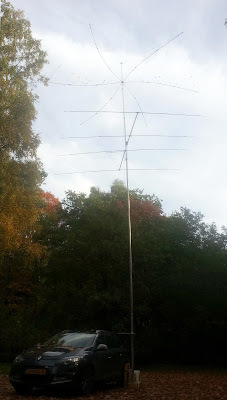 What I learned for the contest this weekend is that it is useful to bring the yagi to catch the weaker DX (assuming 10m is open for a considerable amount of time). I also learned that I can have both beams on my mast at the same time. This gives me another nice opportunity: if I point the yagi and hex in opposite directions I can quickly check short path versus long path propagations on 10m. That is a feature that helps me as I am not used to working with a beam and therefore have too little experience to choose the right path given the direction and time of day. Looking forward to more fun this weekend. After two months in which I had no time at all for any radio-activity (imagine that...), I managed to free up a couple of hours on Wednesday afternoon. With about 4 hours I had just enough time to go out with the hexbeam and look for some DX. Conditions had been OK in the preceding days, with openings on the higher bands (10-12m), so it looked like a good investment of my time. Taking the hexbeam out does limit the time left for actually being on the air as I have to bring more stuff and need more time to get it all set up (and broken down again). All in all I think I need about 1,5 hours to get all stuff in the car, drive to my favourite location, set up the station, pack everything in again and drive home. This left me with 2,5 hours to be on the air. When I had my station ready I saw Dervin PD9DX was working from YB0 on 15m. I know Dervin from the PAFF program and he put in a very good signal. Enough reason to give him a shout and have a short chat. After that first contact I was scanning the bands and the cluster for DX activities, logging a total of only 12 contacts but interesting ones. It turned out to be a nice DX afternoon, even though conditions weren't especially good. I worked a couple of new ones: C8, H7, FR and TN (Dutch DXpedition), two OD stations on two new bands (15 and 20), and a new prefix from Canada: CK1. Noteworthy but not new were TO2 on 10m (already worked that one during WPX earlier this year), VK4 and YI1 on 15m. One very peculiar thing: I worked TN on 12m long path... I still do not understand it. The signal was S0 sometimes peaking S1 on short path. When I turned the antenna around while looking at the S-meter I saw it peaked S3-4 when the antenna pointed north. I tried turning the antenna around a few more times, with the same result. Go figure.. TN is 6000km due south from here. - VP2, he was not very strong and there was quite a considerable pile-up. He did hear me once, asking for "the NO/P" station to come back but he consecutively answered a French station that called over me. I do not understand operators that do not manage their pile-up. It promotes selfish behaviour of chasers. - V6, was very weak (S0-1) and had a large pile-up. No chance there. There was also a VK5 station working from an IOTA location. He however had a zoo from "5 to 10 up".. so I skipped that one. This was a nice exercise in preparation of CQWW - my next radio opportunity. I already booked time off family duties well ahead and have so far still managed to keep the claim on Saturday afternoon and evening and a part of the Sunday morning. So I will have some serious time to go out with the hex and I will probably bring my 4 element yagi for 10m as well. Looking forward to more DX!